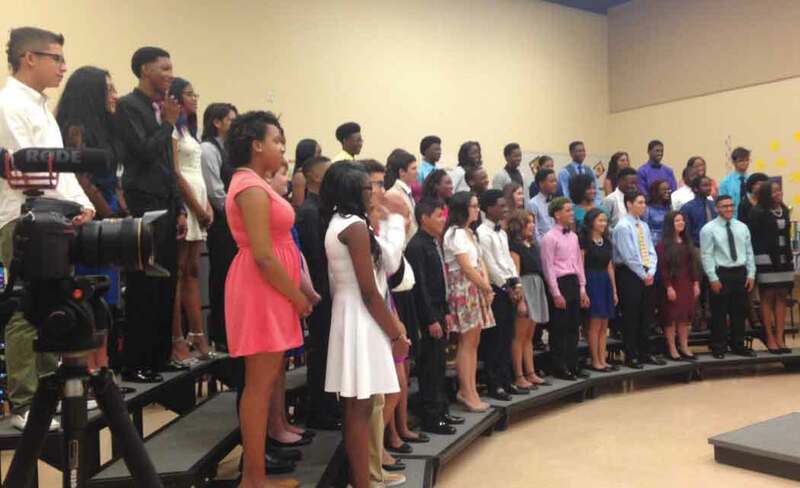 Boynton Beach High’s chorus is the only chorus in the state that’s been invited to participate in the festival. And only seven choirs worldwide have been extended the invitation. A Lord Mayor from London and another London official came to the school Friday to formally invite Dimensional Harmony. Senior Patron and past Lord Mayor of London’s borough of Westminster, Catherine Longworth, along with Robert Bone, executive director of the London International Choral Festival, came to the school, where the Red Carpet was laid out for them, and they were greeted by the Mayor of Boynton Beach, Jerry Taylor, and the school’s principal, Fred Barch. The choir sang for them, leaving a huge impression. There was much pomp and circumstance surrounding the visit, and chorus director Sterling Frederick said it was breath-taking having the London dignitaries come so far to invite the choir to London. “It was a beautiful experience and one of the most thrilling events I’ve had in my life, as well as the students,” said Frederick, who has led the choir all of its 15 years. The nearly 50 choir members are ecstatic. Like Jashonte, Maurice Blue, 18, has never been on an airplane before. He can’t contain his joy at the invitation. “It’s a once-in-a-lifetime experience, so I’m ready to take it (the ride). Not everyone gets this chance,” he said. Kathy Burstein, Media Relations Specialist with the Palm Beach County School District, said the trip will cost $149,000. And the school doesn’t have the money, said Principal Fred Barch. So they, and the community will have to raise the money for Dimensional Harmony to make the trip. Burstein has set up a GoFundMe account online to receive donations. The festival runs from December 29 through January 2 and is part of London’s New Year’s Celebration. It’s in its eighth year and has scouts to find the best choirs, orchestras and bands in the world. Boynton Beach’s Dimensional Harmony was among those they had heard about and then sought out and extended the invitation. “It’s a tremendous honor,” said Frederick.